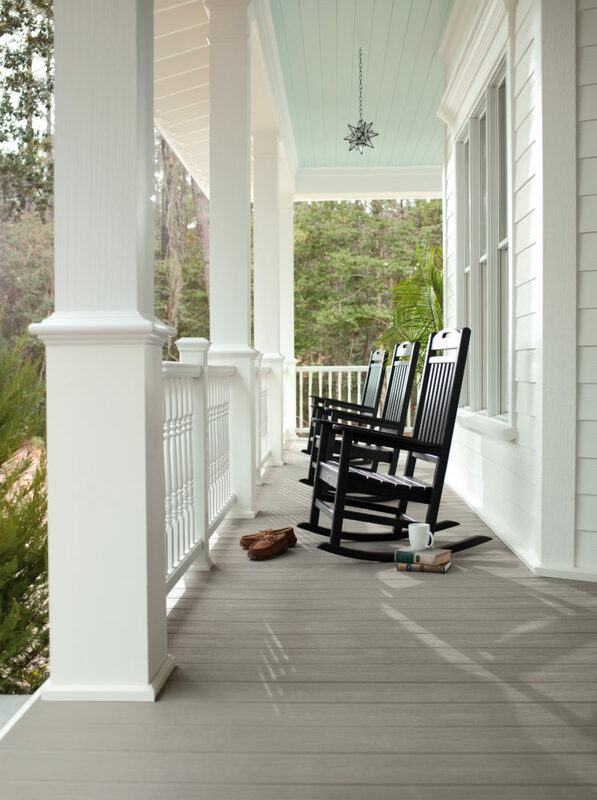 Rocking chairs have been the preferred method of watching a sunset or soaking in the world outside your front door for nearly three centuries. Rocking chairs were initially used primarily in gardens, and resembled simple dining chairs with sloped rockers attached to their feet. We’ve come a long way in furniture design over the course of 300 years, and now there are a dizzying variety of styles, materials, and colors to choose from. Each individual rocking chair is designed for specific environments and uses, making the shopping process potentially confusing or frustrating. Luckily we’ve collected our considerable knowledge about this classic outdoor furniture item in one place so you can buy a rocking chair with confidence. How comfortable is the material? How does the material stand up to outdoor weather conditions? How long does the material last, and how much value does it provide? How does the material look, and how does the design complement your space? How often do you need to clean the material? Softwoods like pine are popular choices for making rocking chairs, as the material is abundant and relatively inexpensive. Softwood is easily dented or scratched and is not very durable, leading to a worsened appearance quickly. Softwood must be varnished if placed outside, and will degrade quickly in the elements regardless. Softwood is a less expensive material. Hardwoods like oak are longer-lasting than softwoods, but must be regularly maintained. Hardwoods are resilient, meaning it is hard to scratch or dent hardwood rocking chairs. Hardwood must be stained or varnished if used outdoors, and must be revarnished to maintain quality. Hardwood is a moderately expensive material. Wicker was more popular when rocking chairs were first invented, but some brands still sell classic wicker designs. Wicker is not intended for outdoor use, and can be damaged and weather very quickly when exposed to the elements. Wicker is lightweight, making it easy to transport but vulnerable to wind gusts. Wicker is one of the more affordable materials. Teak is a more durable wood option for rocking chairs, especially compared to pine, oak, or wicker. Teak is extremely resilient and can stay outside year-round because it produces its own oil. Teak is one of the priciest options. HDPE is a synthetic resin used to construct weather-resistant, high-quality furniture. The luxury and long-lasting nature of the material make it a more expensive option. HDPE lumber is completely resistant to wind, water, and rust, and able to be left outside all year. HDPE lumber is a breeze to maintain with warm water and mild soap. HDPE lumber is available in many colors. HDPE lumber is manufactured to last for decades and the steeper price reflects this. At Trex® Outdoor Furniture™ we manufacture all of our rocking chairs with HDPE lumber. We love that this material is completely recyclable, weather-resistant, and lasts a lifetime. Consider your budget and how long you plan to own your rocking chair before choosing a material. Yacht Club Rocking Chair – Enjoy our popular charming rocker backed by a 20-year warranty and engineered to deliver that dependable relaxing effect. Perfect for the front porch or a garden space. Cape Cod Adirondack Rocking Chair – Outfit your deck or patio with an Adirondack rocking chair featuring the same traditional slatted back design and contoured seat of the Cape Cod Adirondack Chair, coupled with a higher seat height and a strong base for smooth rocking. Cube Swivel Rocker – Created with precise attention to detail, carefully constructed curves, clean lines, and all-weather sling seat, the chair works beautifully on its own or as a companion to any of our dining tables. Yacht Club 3-Piece Rocker Set – Share a moment with someone special from the comfort of your deck. This set comes with two Yacht Club Rocking Chairs and a Yacht Club Side Table where you can keep a glass of lemonade or a slice of pie within arm’s reach. Cape Cod 3-Piece Adirondack Rocker Set – Create the ideal spot to unwind and catch up with a friend with a set that includes two Cape Cod Adirondack Chairs and a Cape Cod Round Side Table for snacks and beverages. While teak and wicker rocking chairs will have limited color options, with plastic or HDPE lumber chairs you can choose several different hues, from natural tones to bright, vivid colors. Trex Outdoor Furniture proudly offers rocking chairs in seven traditional earth tones and all-new vibrant color options you can customize to match the other design elements on your deck, patio, or porch. While many rocking chairs are about the same dimensions you should measure the amount of space you have to work with and decide how heavy your chairs can be before you select a material and a style of rocking chair. Depending on the style rocking chairs will stand between 37 to 45 inches tall, 26 to 30 inches wide, and 32 to 37 inches deep. Rocking chair weights can vary widely between 15 and 45 pounds depending on the material. You also want to think about the seat height — shorter people may want a shorter seat height to comfortably get in and out of the rocker. At Trex Outdoor Furniture our seat heights range between 16.5” and 18”. The overall height for our chairs ranges from 34” to 42.5”, but this won’t affect your experience like seat height will. When arranging your rocking chairs in any outdoor space leave at least two to three feet between each rocking chair. Account for additional space behind and in front of each rocking chair so you can rock forwards and backwards without colliding into walls or furniture. 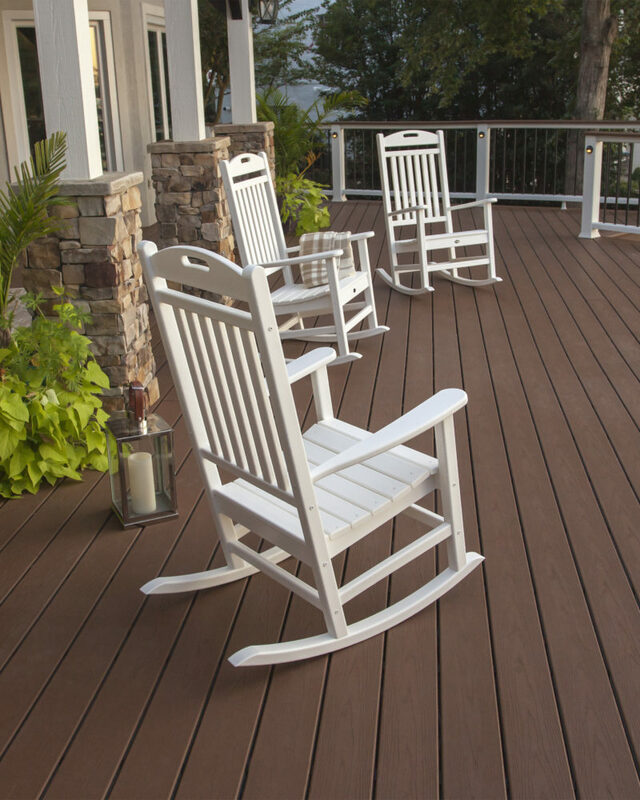 A deck or porch measuring 10 feet square can fit three or four rocking chairs. Your rocking chair will provide hours of extended comfort if you include some extra padding. Invest in a rocker seat cushion to drift off in premium comfort. 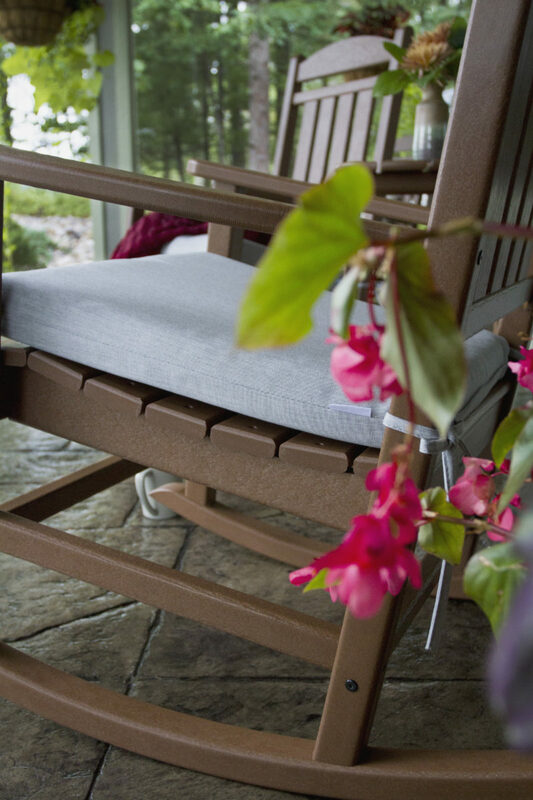 Sunbrella® fabric retains color and withstands elements like wind and rain so you can leave your cushions affixed to your rocker all year regardless of the weather. 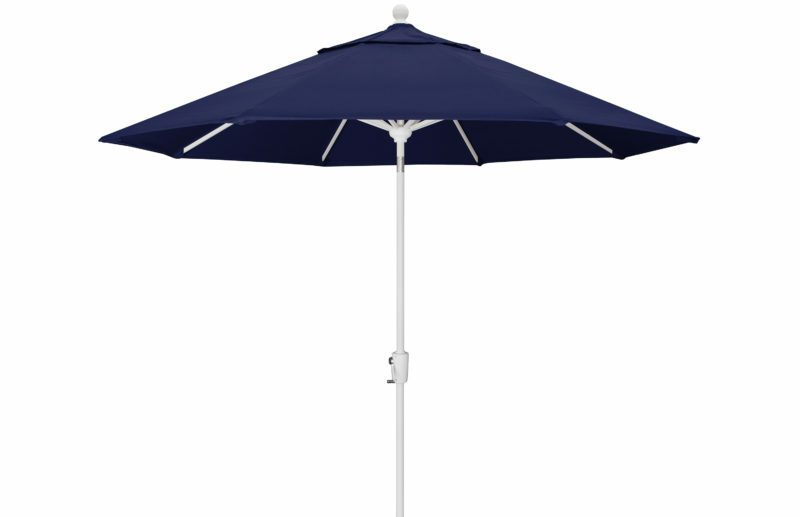 If you place your rockers in an outdoor space without a roof you can install a Tilt Market Umbrella right beside it to give your rocker a relaxing amount of shade throughout the day. Choose between a variety of canopy colors for the perfect finishing touch to your rocking chair area. 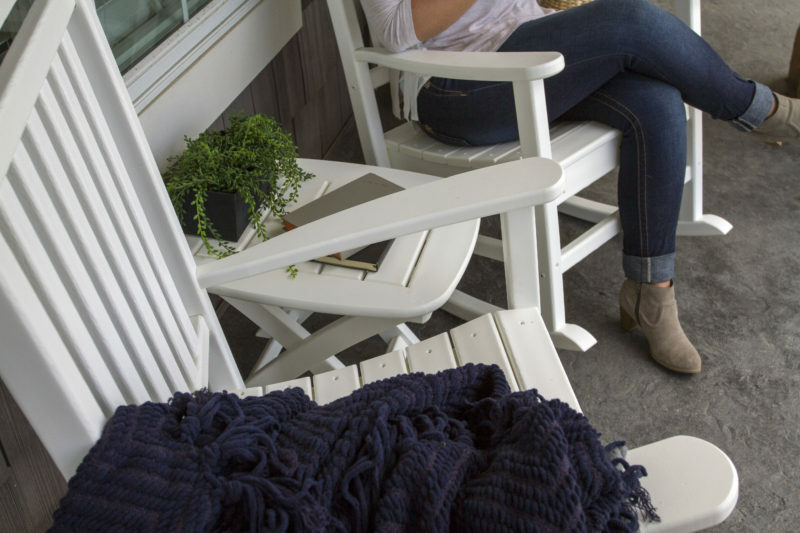 Shopping for outdoor furniture can leave you feeling overwhelmed, but by following this guide you can select the right rocking chair to match your style, suit your preferences, and fit your budget. Shop today to find a high-quality, low-maintenance rocking chair constructed from HDPE lumber that will last a lifetime in your home.